I agree the silent version is first class. However, the seating position of the galley slaves is not acccurate. Also, the Roman navy did not use slave rowers, although slave labor was used extensively in the construction and maintenance of ships. In the 1959 version "ramming speed" was a Hollywood invention. 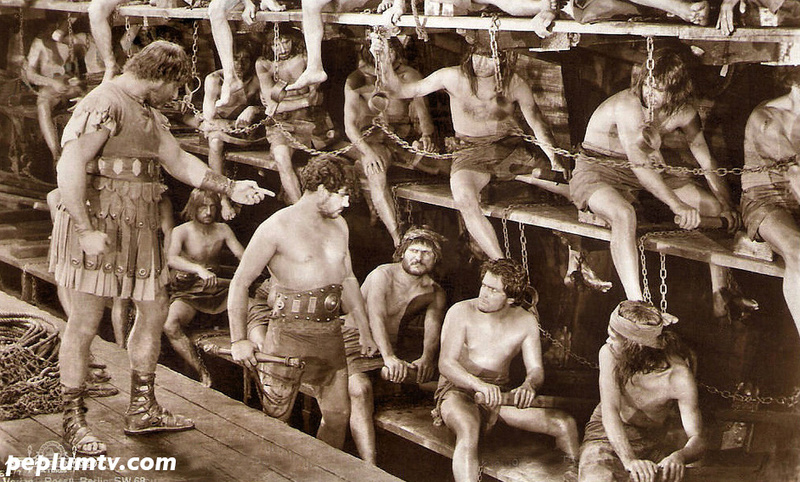 The bronze ram of a galley weighed between three and five tons. It was more valuable than the entire rest of the ship. The Mediterranean basin has ample copper resources, but tin was expensive because it had to come from distant Cornwall. In ramming, there was no desire to penetrate the hull of the enemy vessel to any degree beyond smashing in its planking. A ran that went too far into the target ship could break off, or it could hinder the backing away of the ramming galley.